Last week we covered the last of our episodes on July 1st 1916, that means that this week we will take a step back and do a bit of an appraisal of everything that happened on that day. We will start off today by just talking about some basic numbers and statistics before we roll into how it had effected the British and German armies. We will then discuss a good amount of why some British attacks failed and some succeeded, a lot of this topic has already been discussed over the previous episodes, but hopefully I can do a bit of summarization and analysis to make it all more clear. The last part of our episode today will discuss what the British planned to do next, they were not even close to ready to give up on their great attack, the only question was what precisely they should do next. The fighting of July 1st, of course, did not just end when the sun started to go down. There were many units still fighting throughout the afternoon and into the evening, especially where the British had made at least some amount of progress. There were a few areas where there were truces between the British and the Germans that allowed the wounded to be brought in and helped, but that was definitely not the case in all, or even most, areas. It was more prevelant in areas were the British attacks completely failed and they did not really pose any continued threat to the defenders. In some areas it went beyond just a simple truce and the Germans actively helped wounded British soldiers where they could, especially when it became very apparent that that the British medics and stretcher bearers were completely overwhelmed with the job in front of them. An example of one of these areas was in front of Beaumont Hamel. In this area the British had lost a ton of men, very quickly, and all in the same place. 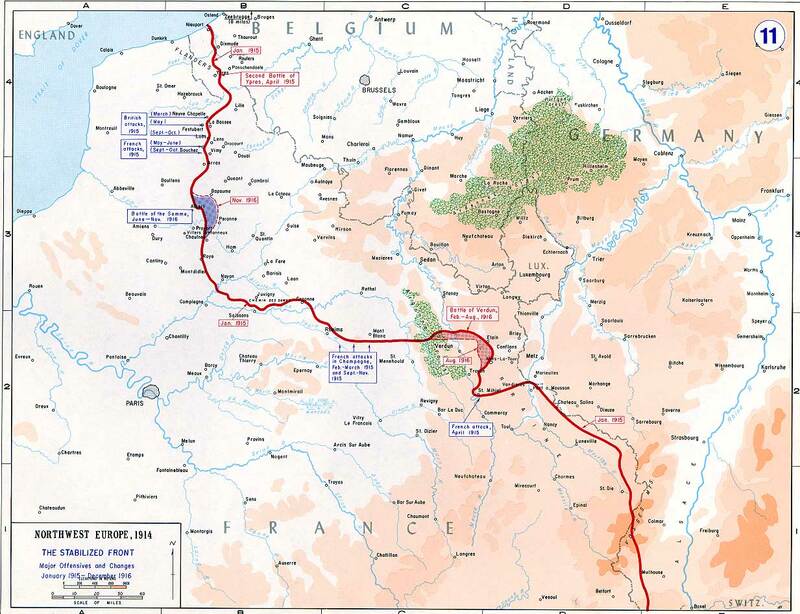 During the night of July 1st the Germans went out into the area between the lines to help the British. Here is Unteroffizer Otto Lais describing how it all happened on his sector of the front. “Evening falls. The attack is dead! Our own casualties are severe; the enemy casualties are unimaginable. In front of our divisional sector lie the British in companies, in battalions; mowed down in rows and swept away. From No Man’s Land, the space between the positions, comes one great groan. The battle dies away; it seems to be paralysed at so much utter misery and despair. First aid men hasten around the area. A complete British medical team with many stretcher bearers and unfurled Red Cross flags appears from somewhere. 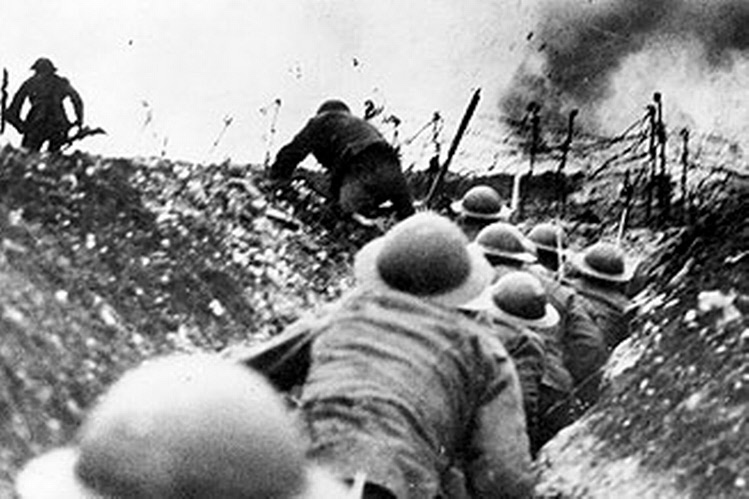 It is a rare and deeply moving sight in trench warfare. Where to begin? Whimpering and moaning confronts them from almost every square metre. Our own first aiders, who are not required elsewhere, go forward to bandage the wounded and deliver the enemy carefully to their own people...” It was unfortunately impossible to help everyone who needed it, and much of this was due to the sheer quantity of the wounded. As always when on the back side of a big attack, lets talk about some numbers. We start with the defenders, and for the Germans their losses had been high by normal standards, but of course this action was not a normal situation. In total the Germans had suffered around 13,000 casualties although that number is a bit shaky for a few different reasons. The first was just normal slight inaccuracies on the part of the German casualty numbers and the second was how the Germans reported their casualties. We know that the Germans lost about 20,000 men during the fighting in the first 10 days of July but we don't have much more detailed information. This was because the Germans did not record casualties per day but instead in 10 day blocks which is why we only make some assumptions on what specifically happened on July 1st or during the bombardment beforehand. Part of that 13,000 number also includes several thousand prisoners, mostly taken on the southern end of the attack. While the German numbers are shaky the French numbers are even worse. Estimates on French casualties for July 1st seem to vary pretty widely, I have seen numbers as low at 1,500 which seems just impossibly low, and then up to about 7,000 or even a little more. I am more inclined to believe that the real numbers was somewhere near the higher end of that range. These numbers seem tiny, and almost normal, especially when compared to what happened to the British. The top line number, and the number that everybody remembers is that the British suffered 57,740 casualties on July 1st and of those casualties 19,240 were killed. Just the exactness of these numbers should say a lot about how much study and research has went into this specific day over the years. This was easily the worst single day for the British army in its history and in fact this day's casualties would exceed the numbers for the Crimean, Boer, and Korean Wars combined. Those are much smaller conflicts, but we are talking about a single day here, and really it was not even a single day because most of those casualties did not happen over the 24 hour period but instead over just a few hours in the morning. I do not have an hour by hour breakdown of what was happening, but I would not be surprised if 90% of those casualties happened before 10:30AM, just 3 hours after the attack officially started. The casualties were also not evenly spread along the front. For example in front of Beaumont Hamel in one Newfoundland battalion 9 out of every 10 men became a casualty in just an hour. While there were technically still men that belonged to this battalion who were still unhurt at the end of the day, it had ceased to exist as a fighting unit. This type of problem would happen all along the front as units were hit so hard that they no longer functioned. In general, of course, the first waves were hit the hardest with more than half being killed or wounded, and again of course the officer corps in these units was hit even harder, with a 75% casualty rate. For the pals battalions in that opening wave, the impact of the casualties on their areas of Britain was felt so harshly. And there could have been a case that it was worth it, if all of this sacrifice would have accomplished something really meaningful, but it didn't. In fact for all of these casualties the British had only reached their goals for a small fraction of their front, and in fact most of the attacking units did not even achieve their goals for the first hour of the attack, let alone the first day. It had just been an unmitigated, unrelenting failure. There has been a lot of thought and research by a lot of really smart people put into why the British failed on July 1st and why specific areas failed so brutally and some had much more success. Success or failure on a specific area of the front was an equation that involved many many variables. Each of them played together to determine if an attack was successful or not. Everything I will be talking about here is something that we have touched on at various points over the previous episodes, but it is definitely worth going back and reviewing. The first variable, and one that it is impossible to not discuss was the relative inexperience of the British troops at all levels, from the newest Private and up through the ranks. This inexperience started at the training level, as Sergeant Jim Myers of the 31st division would discuss in this quote when talking about the training that his and other units received "The biggest mistake that was made on manoeuvres and training was that we were never told what to do in case of failure. All that time we'd gone backwards and forwards, training, doing it over and over again like clockwork and then when we had to advance, when it came to the bit, we didn't know what to do! Nothing seemed to be arranged in case of failure." I am not sure I blame the British officers too much in this regard, sure they probably should have had some discussions about what to do when things went wrong, however, this type of information and the ability to act on it was one of those skills that only seems to come with experience. The next variable was how the troops positioned themselves before the attack. Overall, many units crept out into No Man's Land during the preparatory bombardment, and then once it lifted they tried to quickly rush the German lines, other units just did the second part of this and rushed the German lines from the British front line. It would only be less than a 1/4 of the battalions involved in the fighting that would use the slow method of moving across and into the attack, this was a pretty small number but it is generally the units that people talk about. Sure, it was a dumb moves, however, there really is not much correlation between what the infantry did and the level of success. The third variable was just generally confusion, which probably ties into training and experience as well. Almost without exception there was a huge amount of confusion in the British units after the attack began. This was experienced the worst in the areas where the British were marginally successful. In these areas there was simply no real clear idea of where the first units had gotten to in their attack and this prevented any kind of effective support from being given to them. The hope was that aerial reconnaisssance would be of some assistance in this area, but it was found that the situation was just too confused for aviators to provide any really good information. All three of these variables though, were just a tiny piece of the equation, and in reality made only a small difference when compared to the next two variables, the artillery. I feel like we have discussed the artillery quite a bit, but it was the most important thing on the battlefield at this point. If the artillery did not do what it needed to do, it did not matter how well trained the British were, or how quickly they could traverse the distance between the lines, it just was not going to work. This is why the failure of the artillery to properly neutralize the German defenses and the German guns was so critical. As we discussed last episode, success was almost directly correlated with out well the British artillery prepared the German positions and artillery for the attack so I don't think I need to retread that information. However, one thing that I did not discuss in relation to the artillery preparations and one thing that I did not consider until I read Three Armies on the Somme by William Philpott was that all of the artillery fire had a downside. The British artillery preparations were long, and they were rigid, and they were tightly controlled. Because of this the Germans were able to determine the exact boundaries of the coming British attack, especially on its northern end because the artillery fire just stopped at one point. The British did not have the guns or the ammunition to randomly fire where they did not need it so they had to only use their guns where the attack was going to happen. This was a problem, but was unavoidable, and did not greatly effect the outcome, I just thought it was interesting. The problems for the artillery did not stop when the infantry went forward and instead sort of compounded in on itself. They were supposed to lay down a creeping barrage to protect the infantry, but it rarely worked. To make it work they had to keep their fire right in front of the advancing troops, but the fire almost always outran them. The roots of this was all in the fact that since there was not way to guarantee that the artillery would know exactly what was happening at the front their only option was to fire by timetable most of the time, and when the infantry got delayed these timetables were difficult to adjust. This resulted in the infantry often seeing their artillery fire running away from them. All of these factors combined in various ways to create the failure of the British attacks on July 1st. It is worth nothing that the Germans also had their own beliefs on why the British attacks failed. These beliefs were founded upon information gained from British prisoners and after interviewing many of these soldiers they came to the following conclusions. First, the British reinforcements had great difficulty in getting to the fighting due to the effectiveness of the German artillery fire. The second was that the German wire was far more effective than the British believed it would be. Third, the Germans put of fare more resistance than the British expected. And finally, because the German machine guns waited until the assaulting troops were quite close before opening fire they did not waste ammunition or give away their positions too soon, resulting in a large amount of confusion in the attacking units. This has been just a brief overview of why the British attack failed, if you want more information I highly recommend checking out some of the plethora of available literature like First Day on the Somme by Martin Middlebrook. While the day had been extremely roughon the British, it had not been a walk in the park for the Germans either. Many German soldiers had been taken prisoner, and one of them would later talk to an English journalist about what his experiences had been like in the hours leading up to the attack. He described what it was like to be huddling in the German fortifications, tightly packed with soldiers and with little food and water to go around. “Those who went outside were killed or wounded,” he said. “Some of them had their heads blown off, and some of them had both their legs torn off, and some of them their arms. But we went on taking turns in the hole, although those who went outside knew that it was their turn to die, most likely. At last some of those who came into the hole were wounded, some of them badly, so that we lay in blood." When the attack came, while it was rough at the front, back at headquarters there was a bit of panic. The German generals had known that the British were going to attack, although the French were a bit more of a surprise, however in all cases the ferocity of the attack, and the fact that it would continue on past the first day was a great concern. While on most of the front there was no threat of an actual breakthrough, a threat that was only prevalent in the south, just the attrition of the situation was problematic. This problem, of just sheer manpower shortages, was only exacerbated by how things were handled with reinforcements. Reinforcing units were often fed in piecemeal into either counter attacks or to shore up the line, and then resulted in many getting chewed up by enemy artillery and infantry. In his book Through German Eyes: The British on the Somme Christopher Duffy spends a bit of time discussing this problem, and he places the blame for it on the general structure of the German army at this time. In the German army officers were often empowered to make independent decisions, they were informed of their goals and then were given at least some level of freedom on how to accomplish it. This system worked great most of the time, and is part of why the German army often seemed to be superior to others on a unit to unit basis, however when this system was stressed like what was happening on the Somme it often left each unit sort of fending for itself. At every level of command all that any officer could do when under the pressure was to just take whatever they had access to and send it forward, they were just trying to fulfill their orders by holding ground. One officer would write after the attack that 'Every battle brings with it a considerable mixing up of forces, but here on the Somme this unwelcome phenomenon assumed dimensions which made an orderly conduct of the battle extremely difficult. The root cause was that the enemy were launching attacks in overwhelming force, and we had to put together all the possible units at hand and throw them into action where the need was the most urgent." If the German defense was more unified, and they did not constantly throw in reinforcements as soon as possible into counter attacks, it is possible that they would have lost more ground, but saved lives. This was not the plan for the German 2nd Army though, which caused Falkenhayn to make a move quickly after the first day of the attack. This move was to replace the Chief of Staff of the Second Army. Its commander, Crown Prince Rupprecht of Bavaria would write on July 3rd that “Quite apart from the fact that it is inappropriate to change a Chief of Staff at a moment of supreme crisis, such a measure also amounts to lack of confidence in the relevant commander, who does in fact bear the ultimate responsibility for any decisions which are taken. This, in turn, diminishes the commander in the eyes of his subordinates. As I have already noted, the blame for what happened lies at the door of the Army High Command itself, which did not arrange in time for reinforcements to be allocated to Second Army.” The replacement as the Crown Prince's chief of Staff would be Colonel von Lossberg. He brought with him a new method of defense, which went against what the Germans had done for pretty much the entire war on the Western front, where they had been a bit obsessive about trying to hold onto every foot of land, often involving strongly held forward lines. Here is John Keegan from The First World War describing Lossberg's ideas "Lossberg’s intervention caused the defenders to abandon the practice of concentrating on the defence of the front line and to construct a “defence in depth,” based not on trenches but on lines of shell holes, which the British artillery created in profusion. The forward zone was to be thinly held, to minimise casualties, but ground lost was to be speedily retaken by deliberate counter-attacks launched by organised reserves held in the rear." There was also a shakeup of command on the German front with the 2nd Army split into two, since it had grown so much with reinforcements pouring in. The northern half was given to the 2nd Army, now under the command of General Gallwitz while the southern area was still under the command of Below under the newly created 1st Army. However, Gallwitz was also put in command of the German front that encompassed Below's army which made Gallwitz both the commander of, and at the same level as, von Below both at the same time. This caused a bit of a conflict of interest which will play a part in our further story. Even with the failures of the first day of the attack, there was still no question on the British side that the attack would continue. Unfortunately for the British commanders they did not really have time to stop, get all the information, reflect, learn, and put what they learned into action because they felt, and rightly so, that if they wanted to capitalize on the confusion caused by their first attack they had to launch another effort as soon as possible. With this fact in mind Haig and Rawlinson had to start making decisions on July 1st, as early as the middle of the afternoon while only having woefully incomplete information. These decisions would have far reaching and long lasting effects on the course of the battle to come. What they did know was that they had seen the most success in the south, and they had almost completely failed in the north. This put them in a situation where the most important pieces of geography were still in German hands, and where they had advanced in the south the most important areas to capture lay still ahead of them in the German second line. This put them in a position where they would have to decide on whether they would double down on their failures or double down on their successes. Initially, as was so often the case, Haig and Rawlinson disagreed. Haig wanted to shift all focus to following up on whatever successes the British had on their first day. This would mean continuing the attack only in the south where the advances had been made. Rawlinson thought the opposite, he wanted to double down in the north and send troops to try again on that area of the front. Joffre agreed with Rawlinson, although the French commander was mostly just wanting the British to attack away from his troops so that the French would not get pulled into any needless attacks while they were still embroiled in Verdun. In this case Haig, as the commander, could just tell Rawlinson what to do, which is what he did. As so it was decided that the next set of British attacks would be launched on the southern end of the front. This decision would pretty much set the stage for the next 5 months of attacks. While there had been so much action on July 1st, and both armies were exhausted, that did not mean that the next day did not have things happening. The Germans abandoned a few positions that they had held the previously day against British attacks. In almost all of the cases of this happening it was more about making sure their troops occupied the best positions and ones that could not be easily cut off, like the positions in Fricourt which were abandoned. On the British side most men spent July 2nd consolidating their positions. There were also a few small attacks to gain small tactical advantages. In the south the British were also trying to get ready for the next stage of attacks and that involved a lot of hard work. The first requirement to was to get all of the artillery that needed to go forward to new positions that were within range of their targets and also get them well supplied enough to keep firing. The next task was to get the men ready, and that generally meant bringing in new units. All along the front, not just in the south, as many of the beaten up units were taken off the line as possible and replaced with new troops. This was not always possible, but usually there were battalions available to take the place of the worst hit units. The new troops slowly filtered into the line, but the same thing was happening on the German side as well. 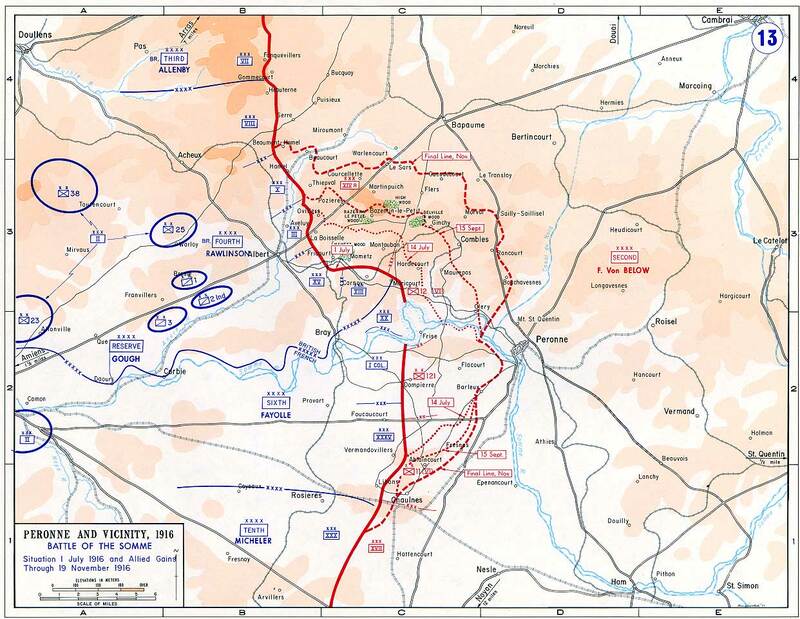 By July 5th there would be 11 new German divisions on this sector of the front and some of these were already beginning to filter in on July 2nd. This greatly solidified the front before the British could do anything about it. One thing that made a huge impression on these reinforcing troops, especially on the British side, were the wounded that they saw coming back from the front and then also when they arrived at the front lines. Lieutenant Hornshaw of the West Yorkshire regiments wrote that his unit was able to hear the wounded out between the lines crying for help when they got to the front. Unfortunately he was not on an area of the front where it was possible to help the wounded. In a few areas on July 2nd officers took it upon themselves to try and arrange truces to get to the men stranded between the lines. Captain Reginald Lindsey-Renton of the London Regiment, 169th Brigade, 56th Division described what happened on his section of the front and how the truce then came to a quick end "A figure was observed standing up in the German trenches making friendly signals, which turned out to be an appeal for a truce. Eventually this was agreed to and both sides went out to collect their wounded. The Germans were very particular who went out, and fired at and wounded some men who started out still carrying rifles. Both sides then proceeded to collect their wounded. There were many Germans who had been taken prisoners and sent back, but got wounded or killed crossing No Man’s Land. The Higher Command had been rung up and asked to suspend all artillery fire, but unfortunately after a short cessation, whether through necessity or ignorance of the situation, the guns started firing again. The Germans thereupon intimated that they would give our men ten minutes to get back, when the truce would come to an end. Owing to this it was feared that many who might have been saved were missed." The wounded who were rescued were only beginning their journey, and they would have to travel past all the men getting ready for the next attack. Here is Gunner Frank Spencer of the Royal Field Artillery "Still more wounded coming past the guns, day and night. They say that many of our poor wounded were shot by the enemy while trying to crawl back to the cover of our own trenches. But, on the other hand, a German doctor and his staff was nicely captured whilst tending our own wounded." The problems for the wounded, and for the dead, was a set of problems that would continue, and the effects of July 1st would continue to be felt in the coming weeks. One of them was more physical than emotional as described by Corporal Joe Hoyles "There was a terrific smell. It was so awful it nearly poisoned you. A smell of rotten flesh. The old German front line was covered with bodies - they were seven and eight deep and they had all gone black. The Smell." In the units coming off the line, even ones that had few casualties, a grim task awaited the officers who commanded them. They began the long task of writing letters to next-of-kin for all of those men who did not make it through the fighting. Lieutenant Edgar Lord 96th Brigade, 32nd Division "Those who know the difficulty of sometimes writing an ordinary letter will get only a small idea of the reluctance to start such a job. One would wish to defer it forever, if it were not for the anxiety of their loved ones." And here is Lieutenant Colonel Alfred Irwin of the 55th Brigade, 18th Division "I hardly know how to begin to write this letter at all. It seems almost an impertinence to try to sympathise with you in such a dreadful loss, but I feel it my duty to tell you how your son met his death. He was in command of one of our leading companies in the attack on Montauban on the 1st of this month, and led his company most gallantly and with utmost coolness up to the German front line trench, where he was shot. Death must have been absolutely instantaneous."